The Gooch family, Stout clan and their allied families (related by marriage) are overwhelmingly Poor, Southern and uneducated Farmers. They includes slave owners, frontiersmen, tinkers (travelling salesmen of miscellaneous household goods) and river boatmen. They were tough but poor people. Why do we care about the Gooch clan and who they married? �Grammy�, Martha Bacon, was born Martha Margaret Gooch, on 26 Nov 1903 in Indianapolis. Where does the name Gooch come from? I must dispose of some family myths. One story (Aunt Hazel told this one) is that we descend from one of the 9 children of a brother of the colonial governor of Virginia named William Gooch. There was an English governor of VA named William Gooch, and he probably had siblings, but there's little proof who they were and that any of them are on are line. There is also no evidence that anyone named Gooch was ever governor of New Amsterdam (another set of family history myths down the drain). Many Gooch families believe themselves to ultimately have Dutch origins, and to be related to Gov. Gooch, and perhaps we can't rule it out completely in some cases, but there is no evidence for any of it on our Gooch line. Overall, Gooch is a decidedly English name. Some argue that way far back the name may have had Welsh or Celtic origins, others are confident that it was Norman or perhaps even Germanic in origin. Gooch may be a variant spelling of another name like Gouge, Goff or �Galtch�. But as far as my co-descendents should be concerned, the Gooch family were overwhelmingly English and most likely our line traces back to Gooch families living in the English counties of Suffolk and Norfolk in the late 1600s (the same heartland as the Bacon clan, incidentally). We should otherwise think of the Gooches as a Virginia clan, there were a great many Gooch families settled in Virginia by the late 1700s. Henry Gooch (~1580 to ~1685) m. Elizabeth Baspoole (b. ~1590), both resident in England. Henry Gooch (~1635 Wrentham ENGLAND to ~1677 Virginia), m. Millicent Goodwin (b. ~1634). William Gooch (b. ~1656, died 1714 Albemarle VA) m. ~1683 Ursula Claiborne (b. ~1650 VA). Claiborne Gooch (b. ~1680, d. ~1759 Albemarle VA) m. ~1710 ? Thompson (b. ~1685 VA). William Gooch (b. ~1717 VA) m. ~1740 Elizabeth Lewis (b. ~1720 VA). Problems: Henry Gooch (b. 1580) is quite an old guy to be father to Henry Gooch (b. 1635), and that's leaving aside the complete guesstimates about his wife's possible age. Others have proposed that Henry (b. 1580) is the grandfather to Henry (b. 1635), or that Henry (b. 1635) is the Uncle to the VA colonial Governor William Gooch, or the Lt. Gov of VA. It's all quite speculative. The link between William Gooch (b. 1717) and Claiborne Gooch (b. ~1680) is tenuous to say the least, and there were at least a dozen Gooch male immigrants to the VA colony by 1700 to choose as alternative ancestors; basically, we don't know if this is the right lineage or not (see a more detailed discussion). I'd quite like the link from William Gooch (b. 1717) to Urusla Claibourne to be proven; Urusla is the granddaughter of William Claiborne,one of the earliest settlers at Jamestown VA (arriving in 1621, almost exactly a year after the Mayflower Pilgrims landed at Plymouth Rock). Given that my dad descends from the Mayflower Puritans, it would only be fitting if my mother's side could be traced to the earliest successful European colony in the future southern USA. There is a common tradition among Gooch families, including in our branch (mentioned in a 1984 interview between my mother and her aunt Hazel (Gooch) MacDermott), of naming one of the sons �Claiborne� (Clay) in each Gooch generation. Why else would we do this if we didn't have a strong family link? The name Ursula also crops up in our confirmed branch of Gooch families. But the Claiborne tradition could have arisen in another way; we may never know. Here is a long discussion of the controversy about assuming who was the father of William Gooch (b. 1717). Estimated to have been born about 1717, William Gooch is often referred to as �William Gooch Senior of Albemarle County, Virginia�, and is easily and often confused with his contemporary and likely distant cousin, �William Gooch of Hannover� who settled in Caswell Co. VA. Our William Gooch also lived in Hannover county VA for a while, although our William was born and died resident in Albemarle VA. He was probably mostly a farmer, although he is recorded as buying land and attempting to mine copper in the Blue Mountains of VA (not for long or very successfully). Jesse Gooch (b. 9 Nov. 1814) m. Elizabeth Ware (b. ~1823, Preble Ohio). 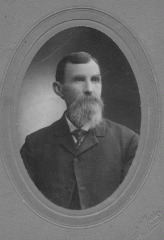 William M. Gooch (b. ~1842) m. 26 Dec 1860 Morgan Co. to Margaret Jackson (b. 4 Nov. 1842 Morgan Co. IN). Charles Percy Gooch (b. 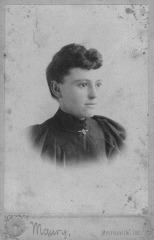 3 Apr 1873) m. Rachel Ann Stout (b. 29 Mar 1871 Morgan Co. IN). Charles Percy and Rachel were the parents of our Martha Gooch. After the Revolutionary War the Virginia militia was given land grants. 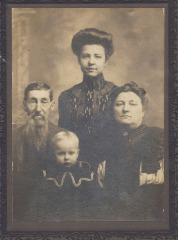 The Gooch family immigrated to Indiana, especially in 1820 and 1821. They travelled by water ways up the White Lick river to the mouth of the Sycamore river in Indiana. Elijah Lang and his sons, brother James Lang, Dabney and Jesse Gooch all came with the first settlers.....We have no record of the year when William N., John, and Phillip Gooch came to Indiana (1822-1824) [and] founded the community which they named Centerton. It was a fast growing community and after a few years [residents] tried to get it named the new county seat. Martinsville was chosen instead, because they had a new road and more water ways. Rivers were very important. Nearly all travel was by water through the dense wilderness. Flat boating became a trade or profession. All five Gooch brothers ran the rivers from Martinsville, Indiana to New Orleans, 1800 miles by water. Products transported were furs, skins, ginseng, bee wax, feathers, corn, and hogs. The men who ran the boats bought supplies in New Orleans. Mules, horses, sugar, cloth, and gun powder. They travelled home by land, over the trail later named the 'Natches Trace' in Tennessee and Kentucky. The men were sometimes robbed by bandits on the way home. They learned to put their money in the bottom of the sugar barrels--also the gun powder in skins. These were the two items most useful in the wilderness. 1824 Establishment of Two Seed Baptist Church, east of Martinsville, Indiana. 1826 Sickness took a great toll on the settlers. 'Bloody Flux'---a diarrhea until one passed blood accompanied with high fever, pain, and cramps. 1830 Census Morgan Co., Ind. Judith Gooch......1 female aged 50-60, 7 total in family, 1 male age 15-20, 4 males aged 20-30 1 female aged 20-30. NB Gooch is recorded as "Goock"
1836 Down in the pocket of the settlement, beginning at the mouth of the Sycamore, and coming up the river, were Daniel Reeves, Kester Jones, Benjamin Stafford, Elijah Lang and sons, Dabney Gooch, Andrew Paul, Gabriel Paul, Jesse Gooch, and John Robb. These all tilled their own soil, drank water out of their own 'moss-covered buckets,' and heard the rain patter on their own housetops, in the year of 1836. The Gooch brothers, Phillip, John, William, Dabney, and Jesse lived near the brickyard. 1842 Cholera epidemic. After the epidemic many of the settlers moved to new territories. 1842 Jesse Gooch assessed a poll tax in Clay twp., Morgan Co., Ind. The following went as bow hands, sometimes as steersmen: Silas Drury, B.F. Stipp, Jonathan Lyons, John Cox, David Ely, Phillip Gooch, William Gooch, John Gooch, Jesse Gooch, Dabney Gooch, Moses T. Lang, -- Most of the above named belonged to Clay township, many of them living in what is now known as the Centerton neighborhood. This was a great locality for boatmen. According to Aunt Hazel the Gooch clan owned most of Morgan County in her youth, but William her grandfather �lost� it due to financial mismanagement; Hazel's father (CPG) said that he and the other children had to go out and get jobs to �keep� their father. 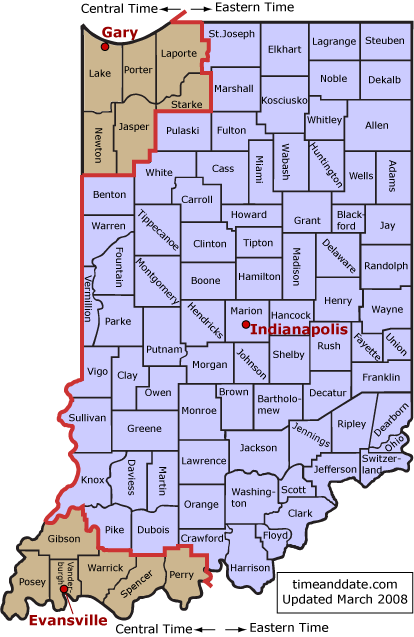 Here is a map of Indiana counties: Morgan county is even now still fairly rural and undeveloped, and is south and west of Indianapolis: . Of Jesse Gooch's wife, Elizabeth Ware, we know very little, although it sounds like a German name. Jesse's son William (1842-1917) is more tangible to us. He was one of at least 9 siblings (the history of his brother Benjamin Franklin is described here). William was Hazel and Martha's grandfather. Family lore has it that this William Gooch married three times, and had had at least 16 children. The children from each marriage were mutually hostile. We descend from William's first wife, Margaret Jackson (they married 26 Dec 1860, she is buried at Williams Cemetery in Washington Tnp, Morgan Co. IN, having died 12 Mar 1880). Her parents may have been Jeremiah and Lucinda Jackson, themselves notable early settlers of Morgan Co. IN. Margaret had, it seems, 7 or 8 children. William Gooch's 2nd wife may be Jane Rushton (a Jane Rushton lived near him in the 1880 Census, and is recorded as having married a William Gooch in Sep 1880). The second wife is said to have brought at least two step children to the marriage; then, after bearing at least two children with William, she left him and moved to the Detroit area, according to family lore. On 10 Sept 1887, William married his third wife, Delana Partum (also recorded as Patrem, Patrum) b. Oct 1864 in NC, �Granny Laney�); she was well-liked by William Gooch's grandchildren. Delana was previously married to an Abner Russell (probably a cousin to Jane Russell White, the mother of Rachel Stout). Delana bore William another 7 or 8 children. Her youngest child was only six months older than Hazel Gooch. by Margaret: Claibourne (Clayborn, 1861-1938), Sarah E. (~1865, "Aunt Sess"), Anna Viola (~1869), Evie (Eva, ~1870), Charles Percy (1873), William Webster (1875-1912) and Dessa (~1878, "Dessie"). Portrait of some of Margaret and William's children. by William's 2nd wife, Jane Rushton(? ): Had 3 children already when she got married. by Delana J Patrum: Frances (June 1885), Albert (7 Aug 1888-24 Jun 1963, WWI veteran), Jesse (May 1890-1946), Arba (July 1892, "Arb" and "Arbie"), Ernest R. (24 Aug 1894, died as a WWI soldier, 1919), Harry (Oct 1896), Roscoe (June 1899) and Fred (Jan 1909). That tallies with the 1900 Census, when "Grandma Laney" says that 7 of her 7 children born alive are still alive. Note: Frances comes from either wife 2 or from the marriage of Delana to Abner J. Russell on 5 Oct 1882. That only adds up to 18 (not 20-24), so I expect some are missing! 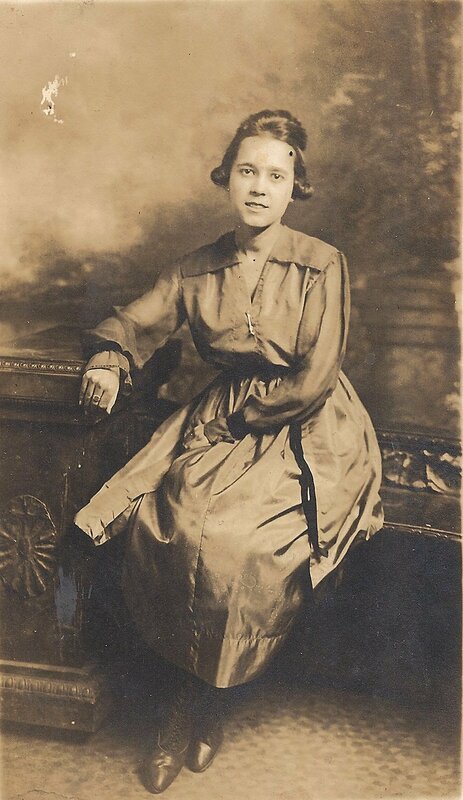 "Aunt Sess" married Joe Parrish, they had Ethel Parrish, mother to Bernice Wilson. 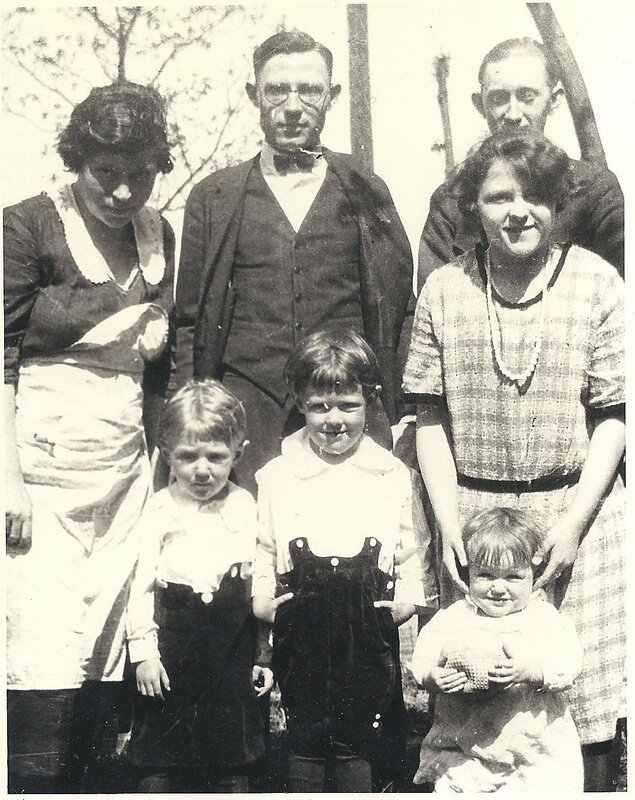 These individuals are shown as four Gooch generations together in this photo: . Other Gooch marriages listed here. According to Martha, William Gooch and family lived in a �broken down house� in Centerton, a town which was �hardly more than than the widest place in the road�. In Feb. 1978, Martha was still in touch with her youngest uncle (Fred, child of William Gooch), who lived in Indiana. About Charles Percy Gooch we know a few more things. He was born 3 Apr 1873 in Morgan Co., IN. He died 25 Feb 1943, buried around 1 March in Crown Hill Cemetery Indpls (his wife buried there later). Rachel kept a dish she bought the first time she met CPG, when he was working with his dad as a tinker (salesman of household goods, toiletries and medicines). Rachel & Charles married 6 Mar 1898 in Indiana). CPG seems to have owned a brickyard fueled by natural gas around the time that Martha was born (1903). 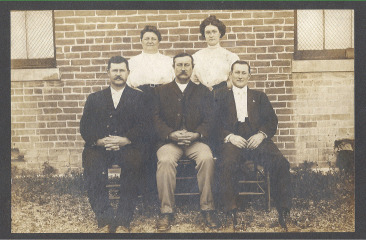 Charles and family to move en masse in with his father in law, George Washington Stout, in about 1906. Charles and family moved back to a rented house at 221 Prospect St., Indianapolis in about 1908. A few years later he managed to buy the house next door, 223 Prospect St, for $1200 (on mortgage, of course). It was a multi-ethnic area, with nearby Italian, Irish and German enclaves. By this time Charles Percy was working as a train boiler repairman just outside of Indianapolis � Hazel and Martha both spoke of what long hours he worked. He lost his job when the industry became unionised; it seems CPG didn't believe in unions and was actively hostile to his pro-union coworkers, working as a SCAB and generally not cooperating with unionised colleagues, until they just froze him out from any further employment (just short of the age when he would have qualified for a pension). He went on to work as an odd handyman, including as a night watchman, until his old age. He never went to church, neither did his son George William, but Rachel and her daugthers were all quite devout. At some point the family moved to East Morris Street in Indianapolis, near the Methodist church where CE Bacon preached and CMB and Martha were married. Rachel didn't consider herself a Methodist, but was happy to send the children to services there. Martha Margaret Gooch, b. 26 Nov 1903 Indianapolis, was the 3rd of 4 children. Her siblings were Fern (b. 4 Apr 1899 Anderson IN), George William (b. 9 Dec 1901 Brazil IN) and Hazel Travillia (18 Jul 1909 Indpls). There are so many things to say about Martha's life that I intend to make a separate web page on her and Charles. 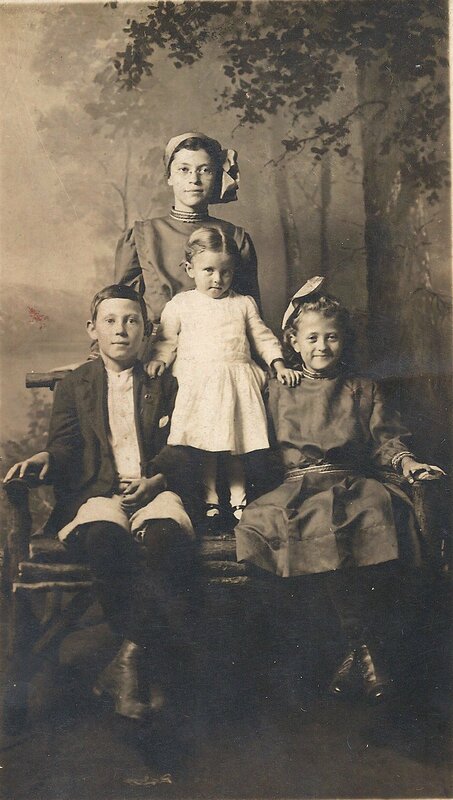 Fern, George, Martha and Hazel, 1912. Fern married D. Lee Andrews, had Keith, Elwood and Rosemary (Bobby, see this pic of mixed Andrews and Gooch family members: . Many of Fern's descendants moved to Florida. She died 16 Apr 1962 in Indpls. George never married and lived with his widowed mother, he worked as a bartender and died 21 Aug 1972, buried at Crown Hill Cem. Inpls. Hazel married Peter John MacDermott and had 3 daughters: Patti (m. Cowling), Shelia (m. Glenn) and Sandra (m. Williams). Hazel divorced Pete before 1975. Most of Hazel's descendants ended up in Texas. Rachel was born 29 Mar 1871 in Morgan Co., IN, and died 11 Dec 1956 Indpls (bur. Crown Hill Cem.). She was the eldest recorded child of George Washington Stout and Martha J. White. Rachel only had one proven sibling, John Stout, born 28 Jan 1880. However, in the 1880 Census, there is a family called Quackenbush living in the Stout household. The 1880 Census said that the wife, Nancy, was a daughter to George. Chatting with Jerry Ann Stout (another Stout family researcher). There is NO ORAL tradition about Rachel having an older half sister called Nancy... However, in the 1850 Census Ezra & Susanna Russell (proven parents to Jane Russell) are living surrounded by lots of Bolens; Nancy E. Bolin married Ben Quackenbush on 19 Apr 1873. I increasingly wonder if Nancy was a first cousin to Martha White, and Ben Q. was like a son to the White family. Ben Quackenbush is found in the 1870 Census living near the White family in Morgan Co. IN, Nancy's death is recorded as 3 Apr 1895, and Ben lives in the 1900 Census for Marion IN with a spouse called Maggie, who he says he married in about 1887; there are records of what happened to their sons Ira, Otto and William. Martha (White) Stout died in the period 1880-1885; George remarried on 9 Oct 1885. After Martha's death young Rachel took over cooking and looking after her baby brother. Despite some valiant efforts on my part, I can't find out where, when or how Rachel's mom died. We have several family portraits of Rachel with her brother John and her step-mother Sarah (C. Stine), like this one, dating from about 1893. His father owned slaves. After the Civil War, these same slaves stayed on the farm to keep working for the same family. GWS served a year in the Confederate Army before going to IN to avoid further military action. He was born in Johnson City, Johnson Co., TN, close to the border with Washington Co. TN. 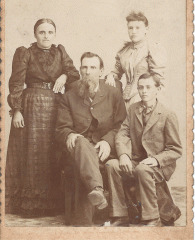 1850Living with his parents John and Rachel Stout in Washington Co. TN, along with siblings ??? 1867 Nov 30 George Stout married Martha White. 1870 GWS is recorded as living with Martha White and her paternal widowed grandmother, Hannah White. 1880 he was 43 years old, living with Martha, Rachel and baby John, as well as the Quackenbush family. 1900 63 yo, GWS living with Sarah and son John on the farm, Green township, Morgan Co., states that he was born in Jan 1837 in TN, and that both his parents were born in TN. 1910 73yo GWS is now a widower. We have a great pic of George with his family in about 1895, showing their large cabin, said to be the only two storey house for miles around. In addition to farming, he worked as a joiner or carpenter. Rachel was convinced that he had inherited land back in TN, but GWS had no desire to ever go back there and claim it. The 1900 Census record is very important because it confirms GWS's birth month and year; we also this old photo with his birthdate written on the back (in my mother's hand) as 19 Jan 1837: . There are several other GW Stouts born in the extended Stout family around the same time, in the same general area of Tennessee, known to be my GWS's first and second cousins, very easy to get confused between them all! Our GWS left behind letters written by his relatives which I have transcribed. Some of the letters are from a Phoebe Stout; my GWS's youngest sister.Phoebe. The letters mention Jonesburgh, the county seat for Washington Co. TN. George Washington Stout was a carpenter, joiner and farmer, and the 17th of 19 known children of John Stout, 1774-1869. John Stout was married to Mary Broyles who bore him 12 children, and then to George's mother, Rachel Irvine (alt. spellings Irvin, or Erwin) in Feb 1826, who bore him a further seven children. We know nothing about Rachel's parentage, although quite a lot is known about the Broyles clan. From the family oral history we know that the Stouts had a large plantation and kept slaves. In the early 1800s the Stout families were especially concentrated in the eastern most tip of Tennessee, in Johnson, Washington and Carter counties). George Washington Stout, b. 19 Jan 1837 Johnson City TN - 17 Jul 1915 Indianapolis, m. 1867 to Martha White (~1848-1882? Morgan Co. IN). John Stout, b. ~1774 Shenandoah Co., VA - 10 Jan 1869?? Limestone?, Washington Co. TN, m. (2nd marr) ~ 9 Feb. 1826 to Rachel Irvin/Erwin ( - 1 Dec. 1874 Washington Co. TN). Daniel Stout, b. ~1693 Bosenbach GERMANY - 1770 Frederick Co./Shenandoah Co. VA, m. (2nd or 3rd marr) 27 Nov 1736, in Eissweiler,GERMANY to Ann Elizabeth Keller (born in GERMANY). Ann Elizabeth died in Shenandoah VA after 1779. The original spelling of Stout was either Staud or Staudt, in German, which may pin down its ancient origins to the town of Staudt, Germany). Both Daniel and Ann Elizabeth had fathers named Johannes, who were born in Germany. Suggested lineage for the Staudts back to 1567 in Germany. Daniel Stout (b. ~1693) is also known as Godfrey (or even "Goodfried") Daniel Stout; the Godfrey name goes down thru the generations among his descendents. Daniel Stout initially emigrated to Pennsylvania, where he was recorded as taking a new immigrant's oath of loyalty to the colony, in 1738. He moved onto VA after that. It seems likely that John Stout Snr. (born ~1753) would have fought in the Revolutionary War (but I haven't found any such record). Stout, Broyles, Keller and Entsminger are all rather German names. Irvin is a rather British name, but up to and including John Stout (b. 1774) it's a very Germanic family. Such a generic name is hard to trace. It is definitely English, although its most likely origin may be something to do with the Isle of Wight rather than the colour white. My mother mentioned meeting many Whites at a large family reunion in about 1947, but we have no record who they were. A tantalising hint is this picture of Loretta (White) Jaggers, taken about 1920. . I've worked out below that Loretta (Retta) was the daughter of James White, Martha White's brother. Retta & Martha Gooch were very close in age, and first cousins once removed. James and family lived in Centerton, next door to Jane White and her daughter Hannah in the 1900 Census. Jane died 10 Jan 1909 in Washington Twp, Morgan Co., IN. Parents = Jonathan White and Jane Russell, married 23 Jan 1845 in Morgan Co. IN. Martha had an older brother, Amos, who died 25 Sep 1849 aged 3y10m 25d (so born 31 Oct 1846, he is interred at Stockwell Cemetery) near his parents. Martha was born about 1847/1848. Amos (31 Oct 1846-25 Sep 1849), Martha (1847/8-1881? ), Hannah (b. Nov 1854), Sarilda (b. ~1856), John (b. ~1859), James/Jackson (b. Oct 1865), Maria A. (b. ~1869). I find it interesting that Jane and Jonathan rarely used pre-existing family names for their children, quite unusual in that era. 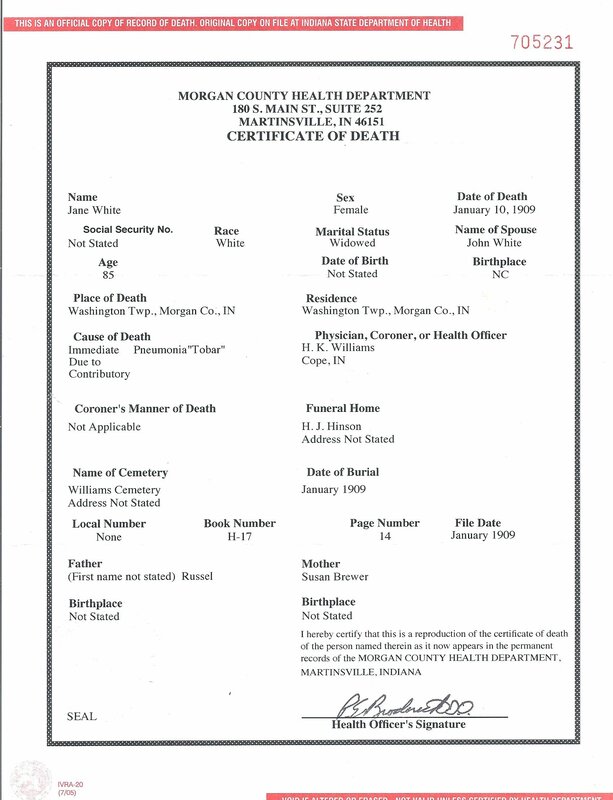 Jane's death certificate states that her mother was "Susan Brewer", which confirms (along with Census info about their birth places) that her parents were Ezra ("Israel") Russell and Susanna Brewer. Ezra and Susana were both born and married in North Carolina, moved to TN for a while where many of their children were born, and then onto Morgan County IN where they lived with a great many others of the Russell clan (probably Ezra's brothers) until their deaths in the 1870s. Susanna Brewer is said to be the daughter of Janie Grubbs and Harmon Brewer of Moore County, North Carolina. I've no more info about them, but I will start digging on Janie Grubbs! One researcher reckons that Ezra's dad was a John Russell. Ezra 18 Feb 1848 RUSSELL stone. Civil War. John H. 12 Dec 1874 15 Jan 1877 RUSSELL stone. 2Y 1M 3D. Son of E & E.
Souseanner 29 Jan 1798 17 Apr 1879 Wife of J.
Martha White's father, Jonathan White, was the son of John White (an illiterate farmer from TN). Jonathan born in IN, probably 5 Jul 1819, and died (probably) 9 Feb 1874, having been a volunteer for IN in the US Civil War, Company H, Indiana 148th Infantry Regiment. No idea about the maiden name of Jonathan's apparent mother, Hannah. The gravestone marker for Jane and Jonathan White is probably in the Hammans-Stockwell cemetery, located on private land, behind the modern Martinsville Golf and Country Club. Given that John White was an illiterate farmer, I think we can presume he came from a poor background, but he has property worth an estimate $4000, so not poor any more by 1860. ? ?Did any of Jonathan White's siblings also fight in the Civil War? I know this page is full of errors and omissions, some I haven't corrected yet and many I don't even know about! I'll be delighted to be informed and corrected by any commentators. I totally believe you about incorrect info on Lucy, I got very confused trying to track down the Fleming clan and apologies if I've ever passed on wrong info. If you ever get a lineage for Lucy's ancestors that you're confident about then let me know. Happy Hunting. Thank you for sharing, this was to have some pictures. George Washington Stout was my 4th Great Uncle, his Brother Alfred W Stout was my 3rd Great Grandfather. Hey, Julii, this is your cousin Patty from Texas. We just found this site and Sandra, Sheila and I are excited, There is so much information here. Let us hear from you.